Haglöfs Couloir Pant brings warmth, durability and comfort to a wide range of mountain activities – thanks to smart, minimalistic design and outstanding material. The Windproof and Waterproof shell of the Couloir Pant is made of a GORE-TEX® 3 layer Softshell, 100% Polyamide, 70 D, ePTFE membrane and a flannel backer. 70D polyamide plain weave face. This comes with a 174 g/m² Hydrostatic head: >28,000 mm, RET: <13. GORE-TEX® are a brand who consistently deliver a balance of waterproofness, breathability and long-lasting performance. GORE-TEX® features options of either a 2, 2.5 and 3 layer constructions. This pair of pants is made of a 3 layer process, the three layers are: An outer face fabric (first layer) which has a durable water repellent fabric treatment (DWR), a second layer of GORE-TEX® membrane, which is Windproof and Waterproof, while breathable, then a third layer, which is an Inner lining flannel backer, for a little extra warmth and comfort in the colder days out in the harsh environments. The 70D fabric is a good thickness for durability and weight balance. The 28,000 hydrostatic head allows these pants to work hard for you, while you enjoy the many outdoor pursuits the harsh environments have to offer. At the end of the outdoor pursuits, your life is made easy, with the easy to care for fabric which is machine washable and then tumble dryable! The backer allowed the pants to stay warm and provide protection from the elements. The laminated internal lower leg gaiters with adjustable silicone grip to keep out the elements, is not visible on use, yet performs perfectly. Not a single bit of water, snow, dirt or grit got in or through or under these pants, they rocked at keeping you clean and dry, and the outside elements out. Well tested laying down, laying in snow, sitting on ice, being in deep powder. Wet out was minor, and took hours to develop, even then, it did not affect the reviewer as the GORE-TEX® kept him dry. Initially the regular fit well cut styling of Haglöfs, makes the pants / trousers look fitted, and the reviewer wondered would that allow for enough movement in the seat. Luckily the seat and the whole pants moved well, not a single feeling of restriction or tension in movement. The softshell fabric moved as the reviewer moved on the slopes, without the confining stiff feel of some hard shell ski pants. The soft shell feel means it almost feels a little mechanical stretch and give is present. The waist size is as stated, and is as consistent as what we have come to know with Haglöfs. It could be useful to have adjustable waist straps, as some of Haglöfs ski pants now have. However, this could possibly then become an obstruction, and a difficulty when using these pants for other activities such as harnessed sporting activing. Although, unlikely to be a deal breaker for many. The pants looked great. We had Tarn blue, the blue colouring, looked nice, and worked with the matching jacket and other jackets, and items easily. Perhaps the colour slate may be a little more versatile. The adjustable bottom leg width with snap closure, can allow the style to be a little more optimally fitted, while assisting weather protection. A second snap closure button at the waist for security, could be useful, and is seen in many of the other Haglöfs offering. The reviewer was not eactly sure why there was a different here, perhaps it just allowed for even greater minimalism in style. The absence of the second button closure, didn’t ever show itself to being an issue, as the reviewer noticed no waist securing issue. In fact the trousers sat perfectly in place, and were very comfortable. Suspenders either hanging down by your sides or being utilised, are a nice style aspect in themselves. Who needs denim dungarees when you have these suspenders! 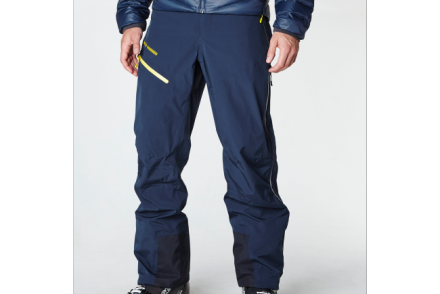 The backer of the three layer GORE-TEX® softshell, along with a thick thermal long underwear / thermal bottoms, is all that is required for most skiing and big mountain activities, even when it starts to get pretty cold. For colder skiers and super cold conditions, another insulation layer could fit under them easily thanks to the regular fit. The large hip to knee zippers for ventilation assisted well. Just be sure not to think they are deep pockets, or you will be fishing inside your laminated internal lower leg gaiters in no time! The minimalist style of these pants limits the features, however those on offer are really the main ones needed, and a minimalism is often what is looked for when selecting pants by some of our active reviewers. The suspenders were a useful touch for comfort and better secure fitting when undergoing more active use. 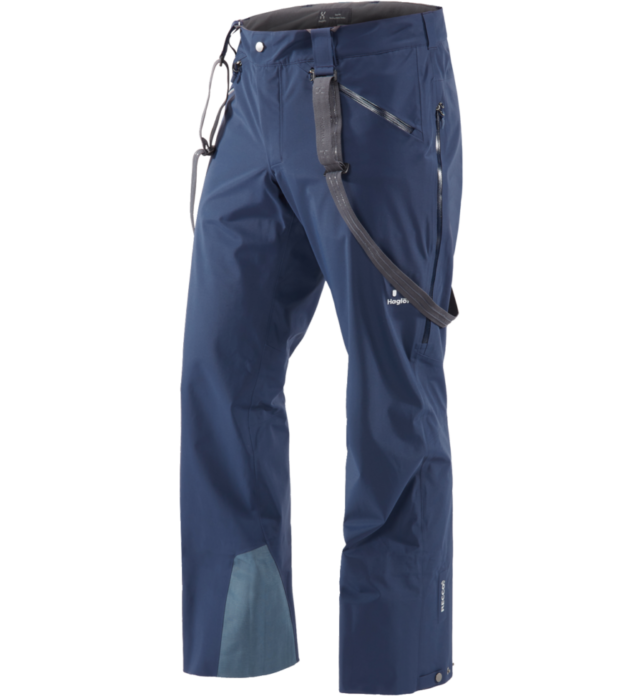 Which fits well as these pants are developed with freeriding in mind, with features such as reinforced insteps and snow gaiter. The gaiter did its protective role well and will extend the lifetime of the soft shell pants considerably. The RECCO® reflector is integrated on the lower limb, for search ability in difficult situations. A feature which is always appreciated. Two front zippered hand pockets, offer a simple and minimalist option for securing the odd item, such as some cash or a tissue etc and doesn’t obstruct the hip function, and doesn’t dill the side of the upper thigh, limiting the risk of falling hard on the items secure in the zipped pocket. At the end of use, the cleaning process was very simple, the reviewer jokingly remarked he believed they had a self-cleaning mechanism, as only a wet cloth wiped over them cleaned up all minor marks from dirt, grit and snow. Looking almost as good as new. Ready for the next brisk weekend away. Haglöfs have a durable, minimalist, multi-use, wearable in many environments and temperatures pant. The Couloir Pant are a very comfortable soft shell pant offering great lower limb protection during activities such as Skiing, Snowboarding, Husky dog sledding and outdoors ice skating.